With the flaming ring on the album cover, lyrics about Satan and with a name like WEAPON UK figuring out their genre of music was a bit of a no brainer. For the past year writing as a Metal journalist I have seen a huge rise in the number of New Wave Of British Heavy Metal (NWOBHM to you and me) bands emerging from the depths of hell onto Earth’s paths. 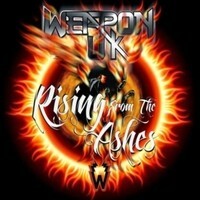 WEAPON UK are no exception and I think their first full length album “Rising From The Ashes” will ensure their place in the NWOBH is for eternity. WEAPON UK originally formed in the 1980s when they were called WEAPON until copyright issues from a band with the same name came to light, so from that point on they are now called WEAPON UK. During that time they released a couple of singles, an EP and a demo. With their first full length album under their belts things could only get better. Now onto the album; I have to say as a fan of NWOBH myself this was a wonderful specimen that I don’t think I am going to be forgetting anytime soon. From the beautiful ballad “Alamein” to the fist pumping “Warrior” I was treated to an eclectic selection of empowering songs that will suit every mood under the sun. The classic guitar riffs, excellent keyboard work, powerful vocals and thunderous drums form together to create a beautiful music fusion that will capture hearts worldwide. I would definitely class this as an album I could to listen to over and over again without ever getting bored. As I have mentioned in the previous paragraph each and every song provides the listener with Classic Heavy Metal treat for its die-hard fans. If they continue to produce more anthemic songs such as “Bloodsoaked Rock” and “Celebration Time” then I think they stand a great chance of raging into the Metal Music industry unarmed.